I really love these charm chain bracelets, and this one is a little different. I usually make these in silver or gold, but I tried something new with this black star bracelet. I’m not sure it’s quite my style, but is definitely fun to wear when I want an edgier look, and is perfect to wear with a ton of other bracelets. I think this will be a nice complement to some of my Halloween jewelry. Do you have an edgier piece you keep in your collection, just for those special looks? This is a newer piece I have listed in my Etsy shop, and I think it is the perfect summer-to-fall piece. Yellow, orange, brown and gold tones come together to create an overall amber color. This color arrangement reminds me of changing fall leaves. I know that’s been nearly a constant theme with me lately, but I am so ready for fall! These beads are supported by gold plated memory wire. They are a bit chunkier than some of my other pieces, giving almost a cuff bracelet effect. The bracelet is big enough to be a statement piece, but not overwhelming. I love these glass beads because they look appropriate for both casual and more formal outfits. If you’re interested in checking out this piece in my shop, click here! These simple but sparkly earrings are a perfect fall accessory! While they’re an obvious choice for Halloween wear in such a vibrant orange color, I think they would look really great for Thanksgiving, too. They are also the perfect color to support my alma mater, and now that it’s college football season I’ll be wearing my pair every Saturday! These earrings have been my best seller since revamping my Etsy shop and product line. I think it’s because they’re sort of the Goldilocks of earrings – just enough sparkle, just enough dangle, nothing too crazy or over the top. These leverback ear wires are my favorite type, too. No more losing earrings (trust me, that’s a thing – at least for me – and these ear wires brought that to an abrupt halt). What do you think of these fun fall earrings? I love making these little 3″ x 3″ cards for sending quick notes or as gift tags. 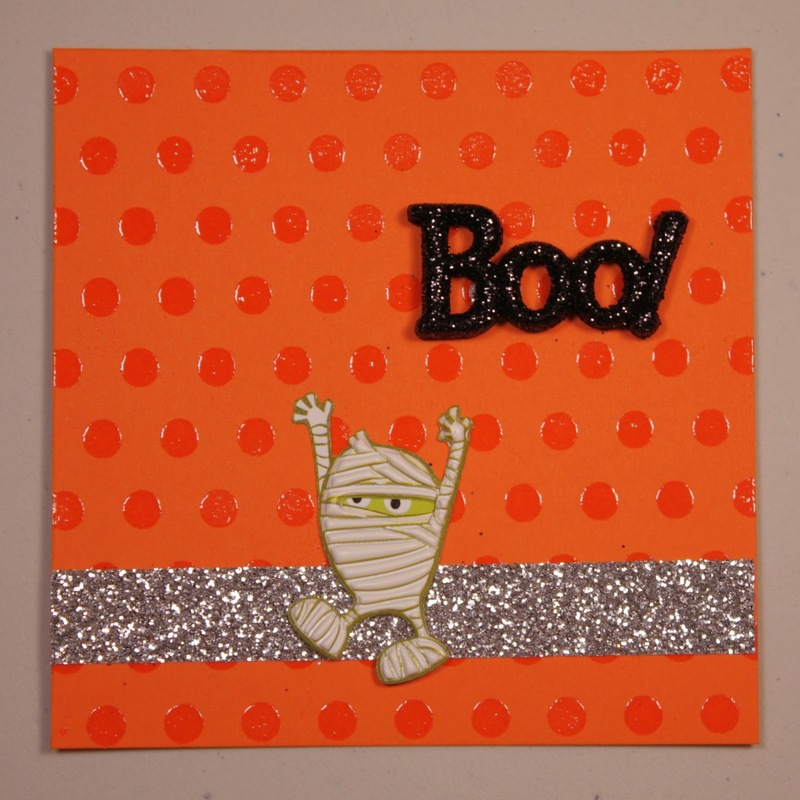 I’ve been working on making some for Halloween, and in the same spirit of yesterday’s post, I wanted to share this cute card! I started by heat embossing the polka dot stamp using VersaMark and clear embossing powder, then adding the silver glitter tape (reinforced with some Tombow permanent tape adhesive), glittery Boo! sticker, and the cute mummy sticker. This little mummy is probably my favorite sticker of all time. Whoooops. While getting ready for my first craft show (yay! ), I missed a few days of posting, so I’ll be making up those posts over the next few days. I am in FULL ON fall mode now. That means I’m also really into Halloween jewelry right now. I love using not just orange and black, but also lime green and purple for Halloween colors, and this bracelets uses all of those colors. The tiny skull charm with rhinestone eyes is a cute finishing touch on this piece. I usually lean more towards jewelry pieces that are multi-use – not very trendy or seasonal – but this bracelet screams Halloween and I can’t wait to wear it! You can order your own Halloween memory bracelet from my Etsy shop for only $9!